Now that the Feb. 27 deadline has passed for people to file for state, local and federal office in the 2018 Maryland Gubernatorial Election, an examination of those who have signed up reveal a broad spectrum of candidates. Many incumbents are running for re-election, several newcomers are testing the waters, and some who frequently run and have yet to win are taking another shot at elected office. More Republicans are entering the races hoping to ride Gov. Larry Hogan’s wave of popularity. And, whether it was from indecision or strategy, several filed in the final days before the deadline. 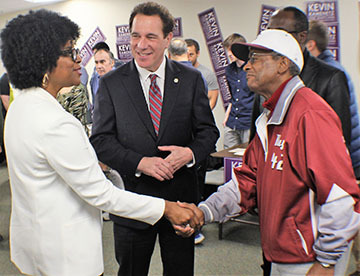 In the race for Governor, Baltimore County Executive Kevin Kamenetz officially announced his bid for the Democratic nomination on Feb. 22 in Towson, with his choice for Lieutenant Governor at his side. The term-limited executive selected Valerie Ervin, a former member of the Montgomery County Council and until recently a senior advisor for the Working Families Party, as his running mate. The ticket not only brings the diversity of an African-American female, but access to the Democratic-leaning voter-rich Washington suburbs. Kamenetz pointed to job creation, noting the progress of Trade Atlantic, redevelopment of Sparrows Point steel mill. The nine Democratic candidates running for Governor include Prince George’s County Executive Rushern Baker with attorney running mate Elizabeth Embry, former NAACP President Ben Jealous with businesswoman Susan Turnbull, and Sen. Rich Madaleno with Luwanda Jenkins, a former Maryland director of the Office of Minority Affairs. Krishanti Vignarajah, an ex-policy director for Michelle Obama and retired Baltimore Teacher’s Union president Sharon Blake are running together. Gov. Larry Hogan and Lt. Gov. Boyd Rutherford are uncontested. Councilwoman Vicki Almond, who represents Reisterstown, Pikesville and Owings Mills in District 2; Senator Jim Brochin, who primarily represents Towson; and former state delegate Johnny Olszewski Jr. from Dundalk, are viewed as the frontrunners for the county’s top spot. On the Republican side, longtime Delegate Pat McDonough will go up against Maryland Insurance Commissioner Al Redmer. In District 10, which encompasses Randallstown, Owings Mills and Reisterstown, Sen. Delores Kelly is being challenged by attorney and former House candidate Rob Johnson. Lawrence Williams, an educator, is also in the race for Senate. Republican Stephanie Boston, a state employee, also filed to run for Senate. Incumbent Delegates Ben Brooks, Jay Jalisi and Adrienne Jones go up against three other Democrats and four Republicans, including Michael Brown, interim executive director for Maryland Classified Employees Association. With Dan Morhaim, elected in 1994, announcing his retirement, District 11 loses one of its veteran lawmakers. Running for a seat in the Pikesville area are six Democrats, one Republican and one Green Party candidate. Observers believe that if incumbents Sen. Bobby Zirkin and Delegates Dana Stein and Shelly Hettleman decide add a candidate on their ticket, that individual will gain an advantage over other District 11 candidates. Looking to join the team is former Delegate Jon Cardin, who served three terms in the House and in 2015 lost a bid for Attorney General. Linda Dorsey-Walker is also running in the predominately Jewish district. Dorsey-Walker is a member of the District 11 Central Committee and was elected a presidential delegate in 2014. After having no competition in years, Zirkin will be challenged this year by Sheldon Laskin. In District 12, which includes Catonsville and parts of Howard County, Del. Clarence Lam has thrown his hat in the ring for Senate, after Sen. Edward Kasemeyer, chair of the influential Senate Budget and Taxation Committee, announced he would not seek re-election. Lam has one Democratic and one Republican opponent. Delegates Eric Ebersole and Terri Hill, who currently serve in the House with Lam, are seeking re-election. There are nine others in the race for a House seat. The hybrid Baltimore City-Baltimore County District 44 will also have a competitive race. Aletheia McCaskill, a daycare owner and SEIU union representative, is going up against first-time Sen. Shirley Nathan-Pulliam. For the House race in District 44B, which includes Catonsville and Windsor Mill, Aaron Barnett, a longshoreman and Aisha Kahn, a day care owner, are competing against freshmen Delegates Charles Sydnor III, an attorney, and Pat Young, a military veterans works as a coordinator of veterans services. The County Council races in Districts 1, 2 and 4, will prove to be interesting. With Vicki Almond running for County Executive, there is no incumbent in the Council race for District 2. Former school board member Marisol Johnson, who filed early, withdrew her candidacy. Competing are one Republican and three Democrats, including Rick Yaffe, Izzy Patoka, director of community development for LifeBridge Health, and Harlan Zinn. Two-term councilman Tom Quirk is being challenged by Sheilah Ruth. Insisting that the southwest county is not getting the attention it deserves, Ruth, a community activist and resident of Westview Park, says it is her time to run. Derrick Burnett of Woodlawn filed to run against first-term Councilman Julian Jones Jr. two days before the deadline. Earlier this year, Jones became the county’s first African American to chair the council. For the first time, voters will elect members to the Baltimore County Board of Education. After little activity, people began signing up to run. In the northwest area, there are five candidates in District 1, two in District 2, and six in District 4. Among them are Cheryl Pasteur, a Pikesville resident and retired principal who has the support of Sen. Bobby Zirkin. Her opponent is businessman Anthony Glasser. Makeda Scott, a former Central Committee member, is running in District 4. For years, elected officials have taken up seats on the Baltimore County Democratic Central Committee. After an editorial by Kenneth Brown questioning the practice of elected officials holding two offices, several decided not to run for the Central Committee. However, Sen. Delores Kelley and Del. Jay Jalisi filed to be on the ballot for District 10. However, there is a lot of new blood, some of them community leaders, such as Danny Blount, president of Hernwood Heights Association, and newcomers such as Charlee Childs, a social activist and IT professional. A total of 11 are running for Democratic Central Committee in District 10, nine in District 11, four in District 12 and 10 in District 44B. Candidates include George White, a military veteran, a BARCS volunteer and photographer for the Northwest Voice. Del. Charles Sydnor III and Aisha Khan decided they would run for both the House of Delegates and Central Committee.